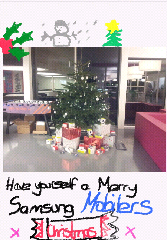 My Samsung Christmas Card To All My Mobiler Friends! I wish them all a Merry Christmas and a Fantastic New Year. I wish you all an exciting Christmas and an even better new year. May it be the start of something big for all of us. Were The Advent Comps Worth It? QUICK #Competition - Monkey Hamper! Review - Mini Micro Seat. Review - KidCam Is A Mothers Best Friend. Review - Do you remember Matey? Isn't It Funny How Flowers Do That? Review - Cathedral City's kids snacks. Review - Zapf Creations Dancing Danni.